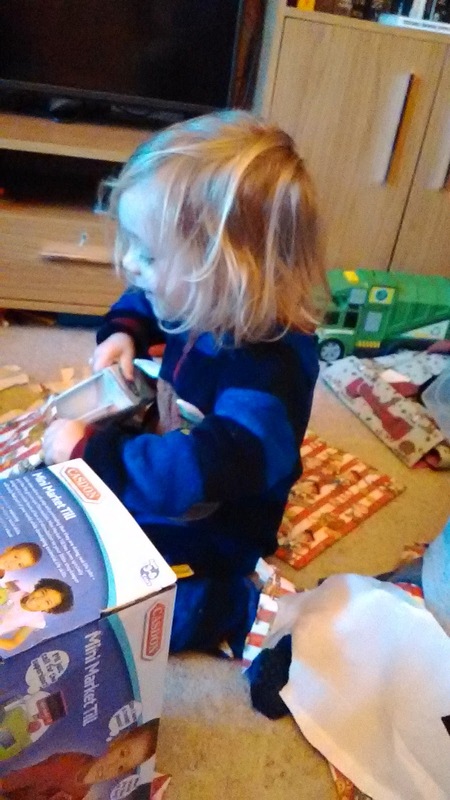 Half term week has been a busy week of preparing for the twins birthday on the Friday and looking after Opie. The whole week was building up to the weekend beginning on Thursday as the hubby had a couple of days off work, which was lovely. 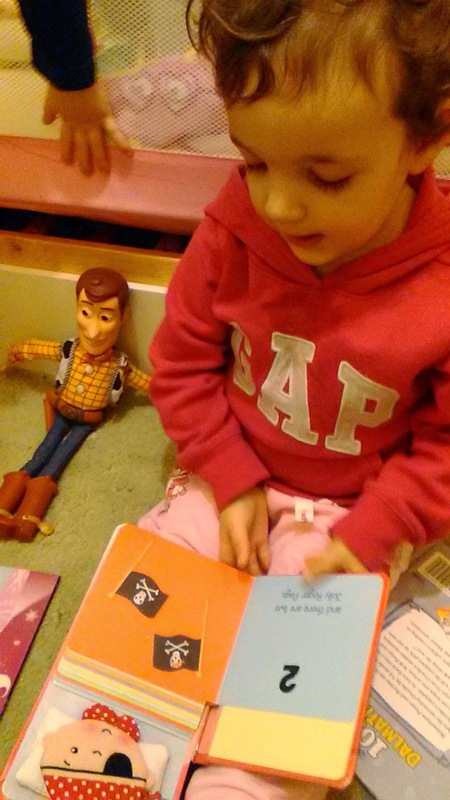 This picture is of Isabella reading to Woody. She was sat in their bedroom and I could hear her chattering away. When I asked her what a she was doing she told me that she was reading a bedtime story to Woody. Monday passed in a blur of jobs. 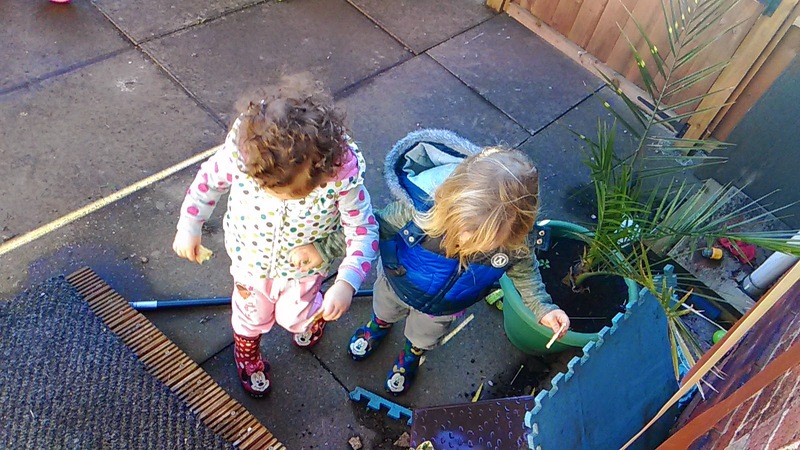 On Tuesday the twins enjoyed some outdoor play in the garden while Joseph was out playing with his friends. It has been lovely to have some dry days so that we can be outside for a bit, however after all of the rain the garden has become so muddy! Wellies are certainly a necessity. Both twins came in a muddy mess! After an exhausting night with the twins due to their colds and the new puppy I managed only blocks of a couple of hours sleep. If it wasn't the twins it was the dog that needed to go out. I was shattered all day and almost fell asleep in the afternoon. 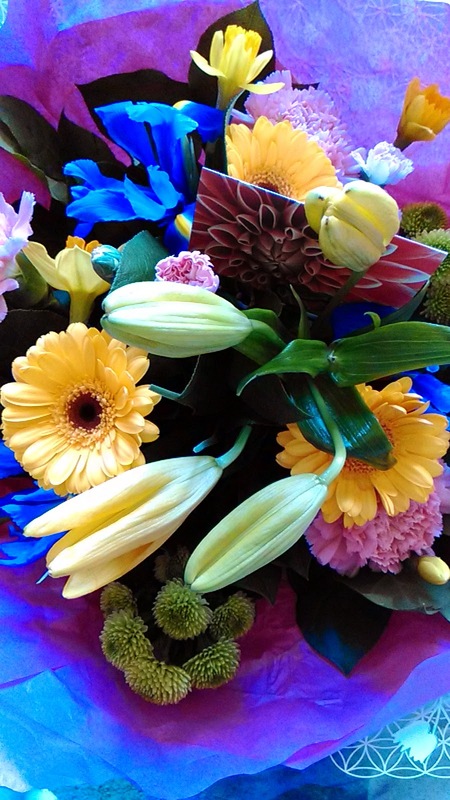 However I did get a delivery of a stunning bouquet of flowers from the hubby to cheer me up! I also managed to push myself to attend my legs, bums and tums class followed by Latino blast session and I felt so much better for going. I never thought that I would say this, but I am loving my exercise classes! Thursday was very much about this little lady. Ever since we have got her she has had terrible diarrhea. At first we thought that it was because of the move. The vet gave us some pro biotic powder to put on her food to settle her tummy. However after she had an even worse episode we decided that she needed to be seen sooner rather than later. 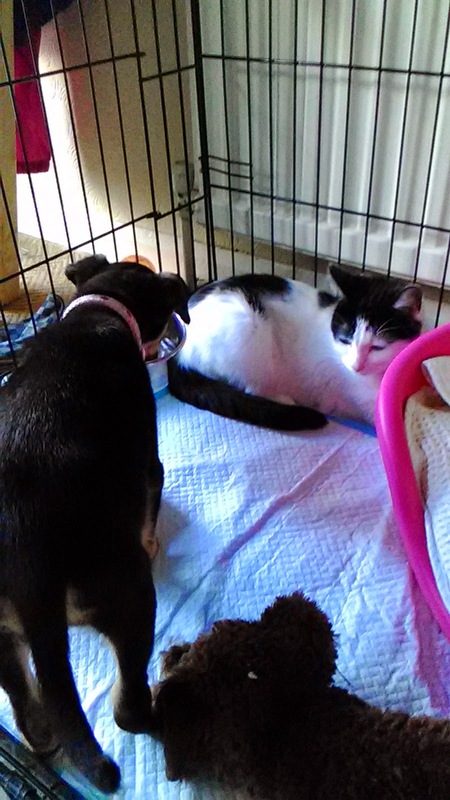 So I got her an appointment and dashed her to the vets. This was such a nerve wrecking 45 minutes! 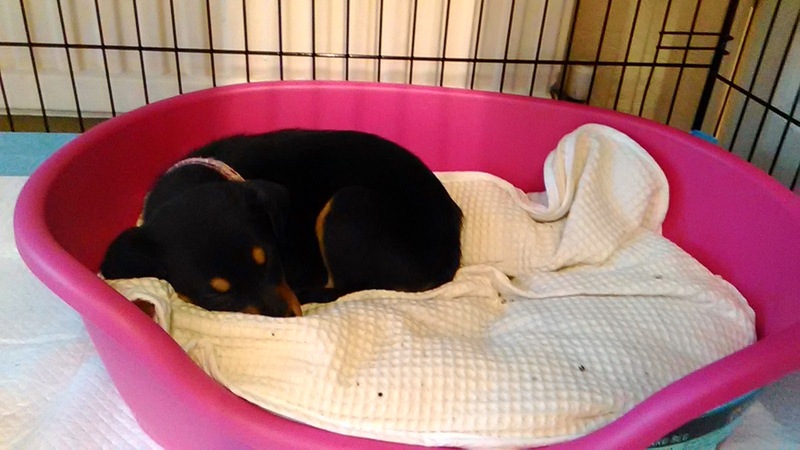 The vet explained that she may have the life threatening Parvovirus. I will admit to crying when the vet explained how she may need putting down if she tested positive for the virus. Thankfully the test came back negative, little Opie, to my relief, has just had a tummy bug! So we came home with some antibiotics. I have become so attached to this little puppy over the last week. The thought of loosing her really did scare me! We spent the rest of the day as a family which was perfect. Friday was all about our not so little beautiful babies. 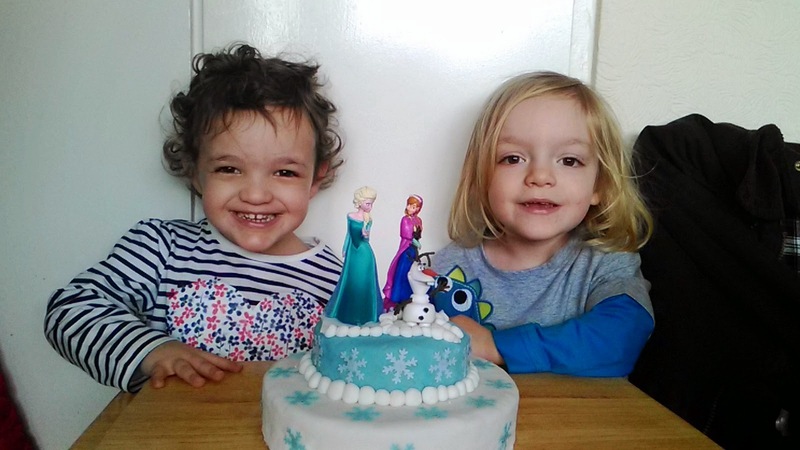 On Friday the twins turned 3! 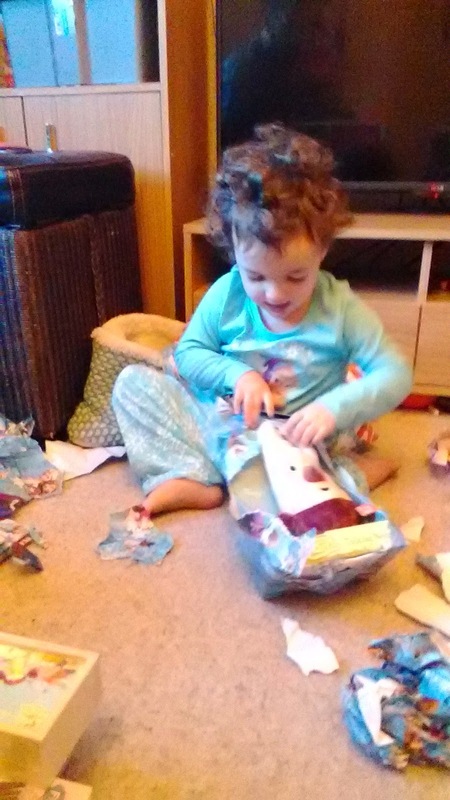 I cannot believe that they are 3! After they had opened all of their presents and played it was time for me to decorate their birthday cake which had to be a Frozen cake! We went out for a birthday lunch with their grandparents, which unfortunately ended with us walking out before our food arrived thanks to the poor service. We did, however, make up for that with a McDonald's! It was a lovely day spent with the people close to us. Saturday was a busy day and not many pictures were taken. The hubby and my dad were out in the garden all day working so it was the children and I for the majority of the day. We had a lovely trip out to town to visit the market and other shops to pick up things that we needed. I was amazed by how well behave all three of the children were. Normally they moan if we are out too long, but they were great during our 2 hour shopping trip. In the afternoon we had a lovely visit from my sister, niece and mum. It is always lovely to see them. I am so pleased to say that Opie has picked up so much since starting her antibiotics. Her appetite has come back, she no longer has diarrhea and is bulking up. She is such a happier puppy. This weeks Silent Sunday will be a picture to treasure. It is so hard to get a good picture of the twins both looking the same way and smiling. This picture is perfect, I love it so much. That is why I have selected it as my Silent Sunday this week. Oh my, how adorable is the puppy!!! I want but not sure if could deal with all the hard work involved with puppies again. Happy belated birthday to your adorable 3-year-olds! 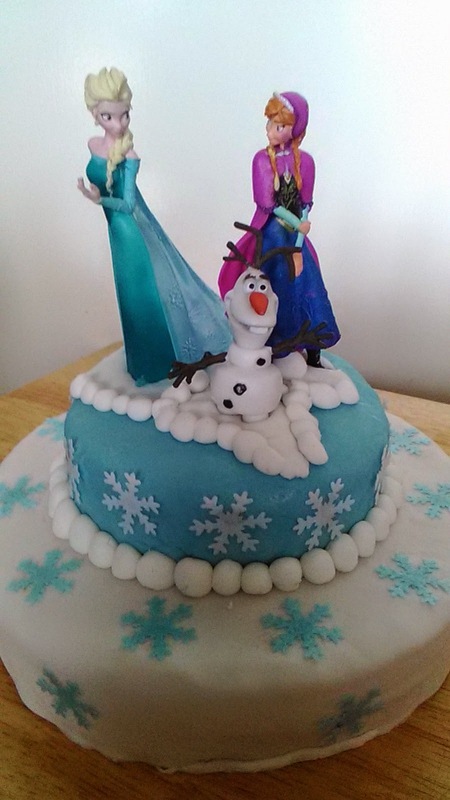 What a fab Frozen cake! And a gorgeous bouquet of flowers. What an emotional week for you - and I mean a happy one! Twins third birthday and good results for Opie from the vet! Definitely a framer shot of the twins smiling. I don't blame you for the tears, must have been such a relief. Oh my, I remember when my twins turned 3, oh the tears at no longer having babies. What a busy and stressful week. I am so pleased Opie is OK it must have been heartbreaking. I hope the twins had a fabulous birthday. I love the Frozen cake. My little one has been peeping into my computer and just informed me that she wants one like that!! Belated Birthday greetings to your little ones. Happy Belated Birthday, wow 3 already, seems no time since I started following you and they were barely more than babies. Thank goodness the puppy is all right, that would have been heart breaking for all of you. It is nice to get some out in the garden weather, our garden is like a swimming pool this week. Oh my! Poor Opie - what a scary week you've had! Happy Birthday to the twins!! !